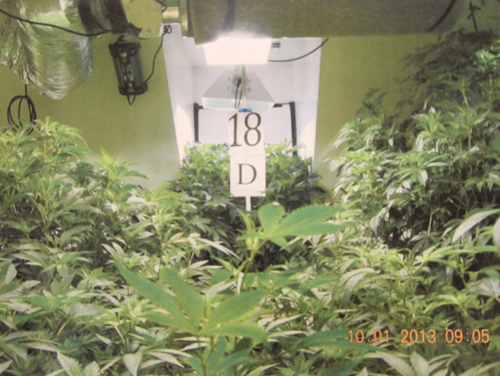 COURT DOCUMENT IMAGE | A photo taken during Tuesday’s raid of an Osborn Avenue property shows dozens of marijuana plants in the garage of Edward Dispirito, police say. As a nor’easter pounded Riverhead with several inches of snow on a cold morning this March, a Suffolk County police detective scanned the houses along Osborn Avenue. He was on the trail of a drug supplier — a “grow house” manager for a multi-million dollar marijuana operation in town. In 2012, a grower busted in Suffolk County had turned informant, giving federal law enforcement information about a large-scale operation in Riverhead Town, run by a former trainee of his who split off to grow his own drugs after a dispute over a shortfall in the profit. Now, as snow fell, the investigator was near the property of the informant’s former protégé. The detective — who served on the Internal Revenue Service task force tracking down the operation — saw more than four inches of snow blanketing the entire roofs of all the houses, garages and sheds on the block. All except one. On a shed behind the garage in the northeast corner of a property just off the main road between Malcolm Way and Mill Road, the snowflakes melted the moment they touched the roof. That hot-spot, investigators say, is where 70-year-old Edward Dispirito was growing a portion of his roughly $3.8 million worth of marijuana plants as part of an extensive growing operation hidden in his house, garage and sheds. That story was part of a sworn affidavit filed in federal court this week by a Suffolk County police detective who obtained a warrant to search the houses of Mr. Dispirito and his distributor, 55-year-old James Ford, an ex-convict with an extensive history of drug arrests living in Seaford. Tuesday’s raids uncovered nearly 1,700 marijuana plants, about 50 grow lamps and transformers, drying tables, harvest records and “multiple years worth of marijuana grow,” and an illegal electrical meter bypass that allowed Mr. Dispirito to steal more than $275,000 in power from the Long Island Power Authority to power his operation, according to the criminal complaint filed in the Eastern District Court of New York. Both Mr. Dispirito and Mr. Ford, who investigators say operated under the name “Jimmy the Garbageman,” have been arrested on federal charges of distribution of a controlled substance. The investigation that led to the pair’s arrest began in October 2009, when members of the Suffolk County Asset Forfeiture Unit — Suffolk Treasury Enhanced Prosecution Program (STEPP) — began looking into a marijuana trafficking ring growing the drugs inside residential homes in the county, according to the complaint. A confidential source had tipped off police to a trio of homes being used to grow the plants and based on the informant, police believed the ring had been in operation since 2005, according to the complaint. After nearly three years of scouring through garbage and watching the houses, the investigation yielded fruit. In April 2012, Federal agents raided three properties in Medford, Middle Island and Manorville, discovering a series of marijuana growing and packaging operations, court documents state. Inside the locations, agents found 28 pounds of marijuana in various plastic bags, 1,700 marijuana plants, an electric bypass system, and grow lamps, as well as roughly $110,000 in cash hidden in a guitar case in the grower’s home music studio, according to deposition in the case. A confidential source from those investigations — who admitted to laundering the money from the marijuana sales with the help of his attorney — alerted police to Mr. Dispirito, who ran one of the grow houses from 2006 to 2008, according to the investigator’s statement. PAUL SQUIRE PHOTO | Police said they found nearly 1,700 marijuana plants worth $3.8 million on this property on Osborn Avenue. Police began tracking Mr. Dispirito, finding a white SUV registered in his named parked at a house on Osborn Avenue in January of this year, an affidavit filed by the investigator states. The investigator in the case later saw a “thin” man exit the house, look around, then go back inside. The face of that man matched a Department of Motor Vehicles photo of Mr. Dispirito, according to the affidavit. After seeing snow melting off the roof of Mr. Dispirito’s shed in March, the detective again staked out the alleged grower’s property in September, noting that the shades were drawn on all the house and garage windows. Two sheds had “roof vents to release heat,” the investigator said. While walking on Osborn Avenue, the investigator smelled the “strong skunky smell” of marijuana blowing south from the house, he said. Federal agents obtained a subpoena for Long Island Power Authority records of Mr. Dispirito’s power consumption. The subpoena revealed that Mr. Dispirito began paying for power in January 2008, the same time he allegedly left the operations farther west and struck off on his own, according to court documents. A hidden check of his power consumption later found he was diverting power away from the original electrical meter. The investigator cited in the complaint called this an indicator that Mr. Dispirito was growing a marijuana farm inside. “Due to the very high electricity consumption of the [grow] lights, air conditioners and other equipment needed to grow marijuana, and its associated high monetary cost, indoor marijuana growers often bypass the electric meter installed by … LIPA with illegal taps,” the detective wrote in his affidavit. Police next used a thermal imaging camera to reveal several “high heat thermal anomalies” in the house and garage, the affidavit states. The detached garage had both air conditioning and a “oddly placed” roof vent blowing out “extreme heat,” according to the complaint. On Sept. 25, law enforcement detailed the evidence against Mr. Dispirito in a search warrant request. Six days later, they raided the property. Court documents show that as police were building the case against Mr. Dispirito, they were also investigating his distributor. Law enforcement authorities had tapped Mr. Dispirito’s phone records and discovered three phone calls over a one-month period between Mr. Dispirito and Mr. Ford, the Seaford man federal agents suspected was a major customer in the three-home marijuana growing operation busted in 2012, according to an affidavit. COURT DOCUMENT IMAGE | Police say nearly 1,700 marijuana plants worth roughly $3.8 million were recovered from Mr. Dispirito’s home, garage, and sheds. “Jimmy the Garbageman” was no stranger to drugs, court records show. In 1978, he was arrested for first-degree criminal sale of marijuana, sixth-degree criminal sale of a controlled substance, sixth-degree criminal possession of a controlled substance and two counts of fourth-degree criminal possession of marijuana, according to the detective’s affidavit in the criminal complaint filed against him Tuesday. Between 2004 and 2012, Mr. Ford bought roughly $6 million worth of marijuana from the Medford-Middle Island-Manorville drug ring, the complaint states. In September, police watched Mr. Ford carry two duffle bags into a Ford van parked in front of his house on Tuscala Street. Two men then got into the van and began driving away as Mr. Ford followed behind on a motorcycle, according to the complaint. Police soon realized Mr. Ford was watching them, so they broke off the surveillance. After obtaining a search warrant, federal agents raided Mr. Ford’s home as additional law enforcement swarmed Mr. Dispirito’s house. Inside Mr. Dispirito’s home, police discovered a similar operation to the one they had busted last year. Agents also discovered trays of drying marijuana, scales and packaging material and stickers identifying the drugs as a product called “Bad Dog,” court documents show. Those stickers matched hundreds found at Mr. Ford’s home, as well as the “Bad Dog” vanity plate on his car, the detective said. Police also allegedly found five pounds of packaged marijuana inside his home. Based on interviews with informants and evidence obtained in the operation, investigators believe Mr. Ford has “distributed well over $9 million worth of marijuana from 2003 to date,” according to the complaint. Both men were arrested and arraigned before U.S. Magistrate Kathleen Tomlinson in Eastern District Court in Central Islip Tuesday. Mr. Ford was released on $450,000 bail secured using his house and help from his sister, a court source said. Mr. Dispirito appeared in U.S. District court Friday and was released under house arrest on $500,000 bond, secured using property from his sisters and a friend.